Most of the time, I bake from scratch. But there are those times when you need a quick dessert. 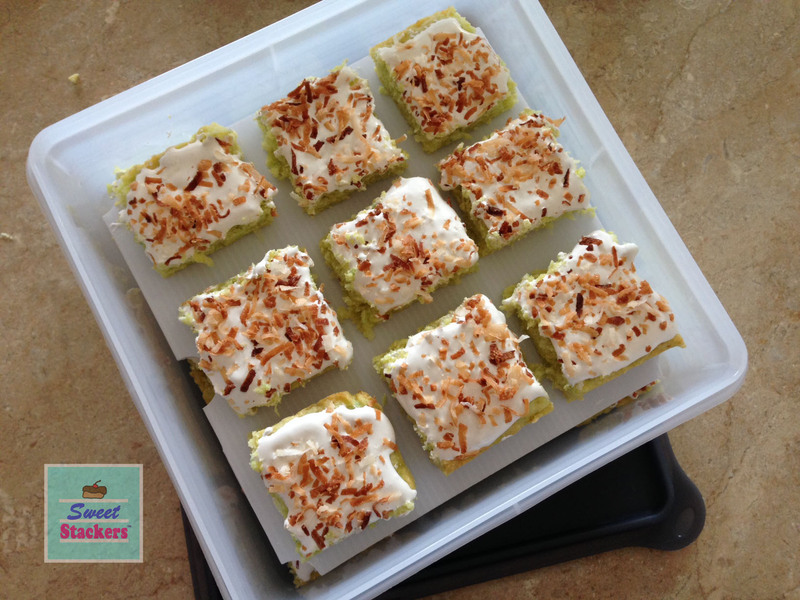 I always keep a couple of cake box mixes in my pantry and tada…we have super simple dessert bars! The marshmallow crème makes a tasty and easy topping – a bit of sweet to complement the tart lime flavor. Preheat oven to 350°. Grease a 9 x 13″ pan. In a large mixing bowl, combine the cake mix, eggs, butter and 1 ½ cups of coconut. Spread evenly in pan and bake for 19-20 minutes until a toothpick comes out clean and the edges turn golden brown. Let cool. 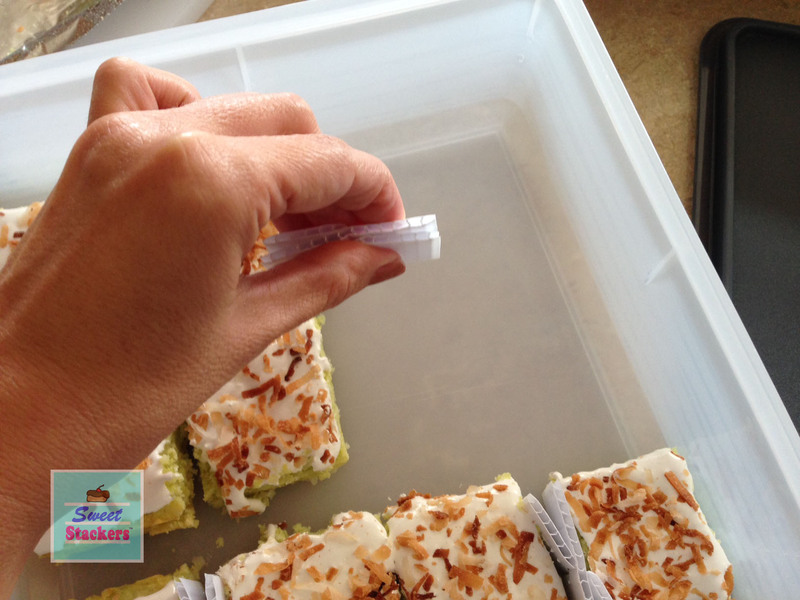 Sprinkle remaining ½ cup of coconut on a cookie sheet. Bake for 6 minutes, watching carefully until it is lightly toasted. 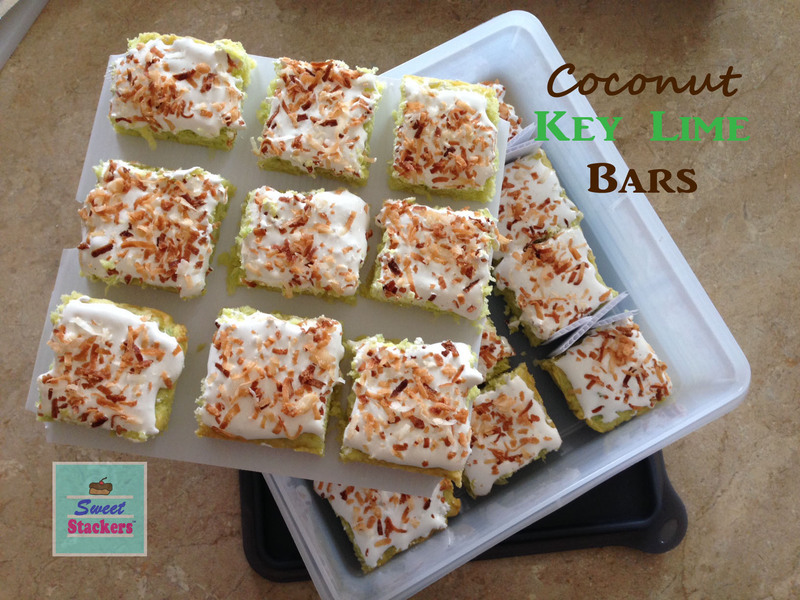 Spread marshmallow crème in a thin layer over the dessert bars and sprinkle with toasted coconut. 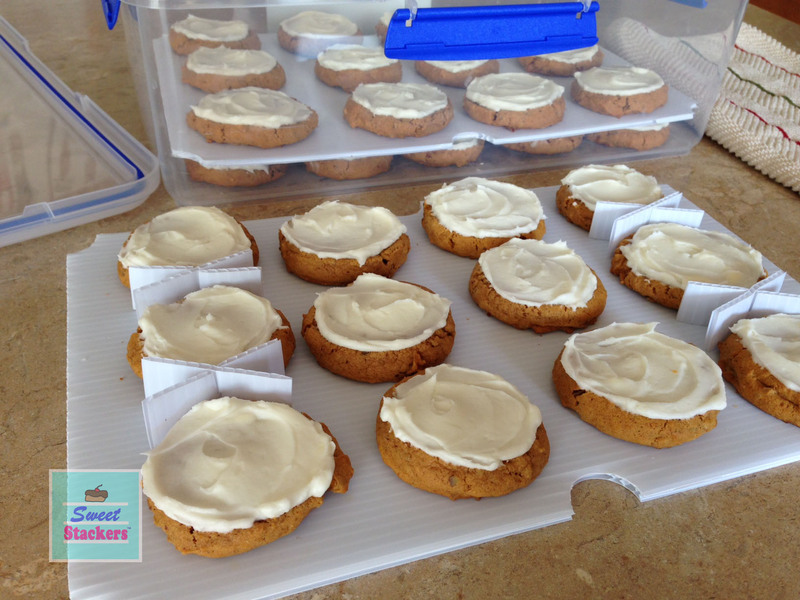 Layer baked goods in one container using Sweet Stackers! This stackable food storage system insert into major brand food storage containers. 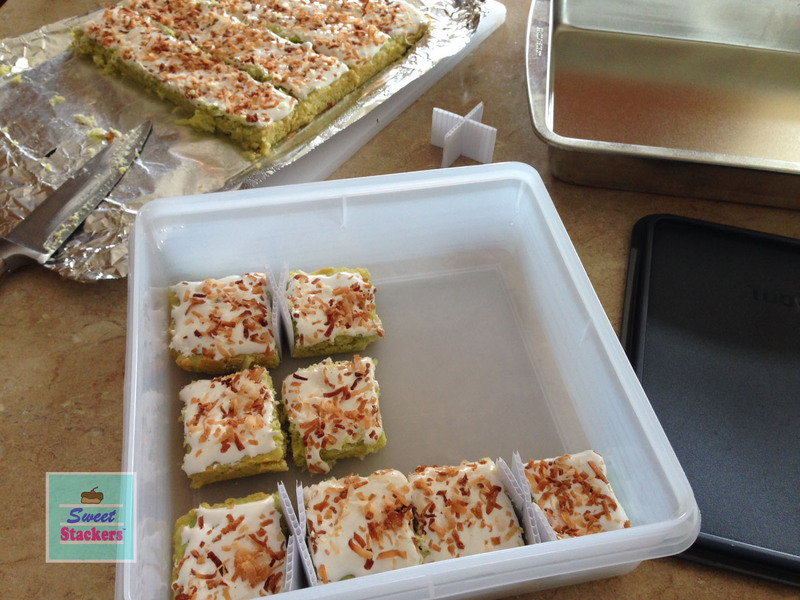 The trays are available in 4 sizes and the risers come in two sizes for either cookies or dessert bars. They can even be squeezed flat in between bars or brownies. Why not layer cookies and brownies in the same container?! 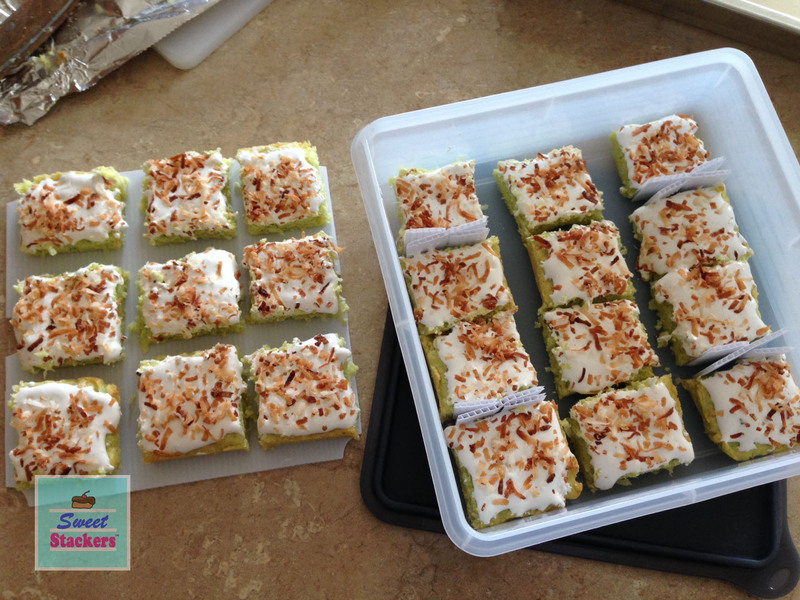 Stack the dessert tray over the bottom layer and they are ready to go! Old world recipes can be very difficult to pass on from generation to generation. Back in the day, recipes were not written down and made from memory. Since they weren’t written down, you just add a little of this and a little of that until you get the “right consistency” and if not you add a little more of this and that. As I grew older and took interest in cooking, I wanted to learn from my Grandmas how to cook their traditional meals. I didn’t want to see these recipes lost forever. Funny thing, as I look back it seemed like some recipes were a big family secret. Today I made one of my favorite main Czech dishes and transcribed the recipe with measurements. Measurements are a bonus because some of the old cook books that my Grandma owned listed ingredients without measurements. I think you were just supposed to know what to do! 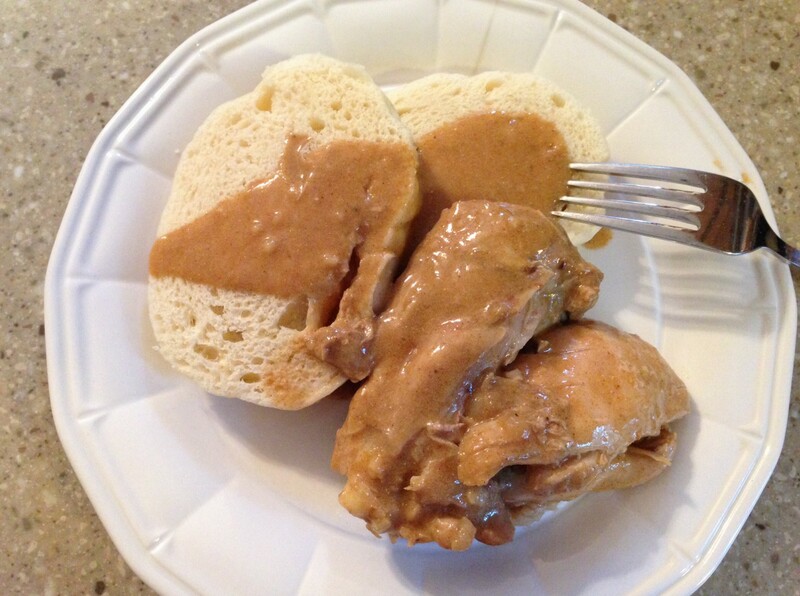 This recipe is so easy and the gravy is absolutely delicious! Gravy always seemed to be so daunting to make from scratch…but really it is easy! For the gravy, whisk flour and water in a small mixing bowl, getting all of the lumps out. This will create a paste. Whisk the paste into the large pot of chicken juices, constantly whisking until the gravy comes to a boil and it will slightly thicken. Add sour cream, continuing to whisk to get any lumps out. Then season with paprika and salt. Let gravy simmer for approximately 10 minutes. Place the chicken back in the pot to heat through. Serve chicken pieces on a large platter with a gravy boat filled with hot gravy. Traditionally this would be served with dumpling. But it is also delicious with egg noodles. My dream is to have a lemon tree someday! 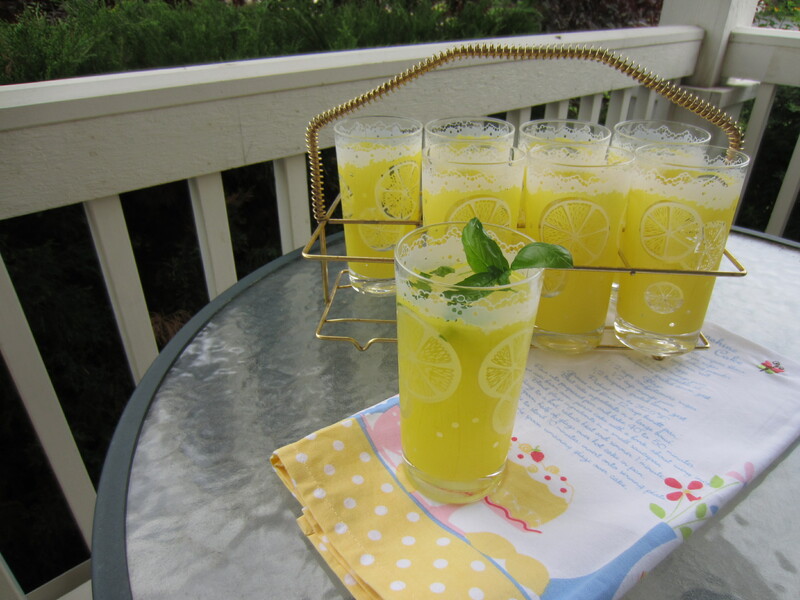 There is nothing more summer than a refreshing glass of lemonade. Maybe this is a silly post to some people, but I have never made freshly squeezed lemonade before. On occasion, I have resorted to buying the powdered or frozen forms of lemonade. Never again, because it is so easy to make your own! In a small sauce pan over medium heat, combine 1 cup of sugar and 1 cup of water. Heat until the sugar dissolves (do not boil). In a large pitcher, add the lemon juice and simple syrup. Then completely fill the pitcher with more water and ice. Everyone’s taste buds are different, so you could add more simple syrup if you need it sweeter or more lemon juice if you need it more tart. Note: to cut back on sugar, I dissolved ½ cup of sugar in 1 cup of water. I infused the lemonade with a couple of ripped leaves of basil in my glass and a garnish on top. I am sure you could do this with other herbs too! What do you add to your lemonade? This is one my “go to” recipes for a weekly meal. 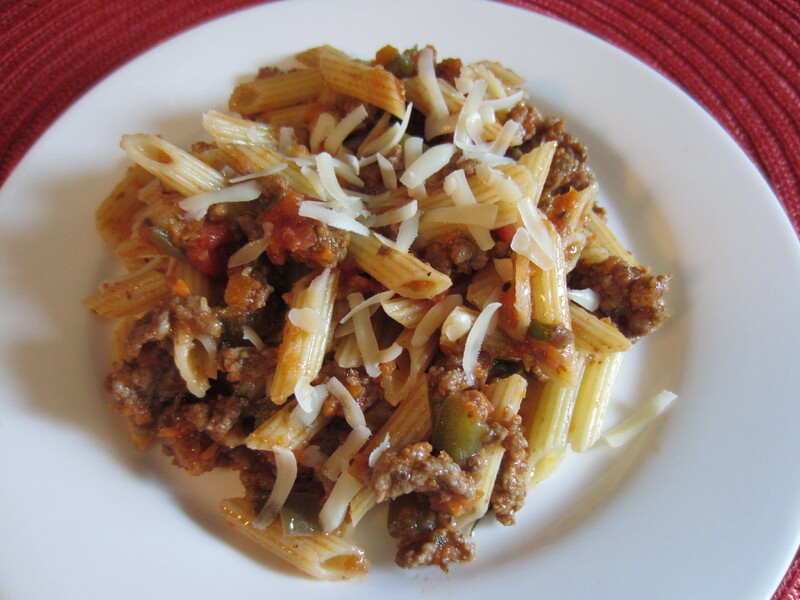 My version of Pasta Bolognese has a bunch of veggies too! There is one unusual ingredient that gives it a ton of flavor – balsamic vinegar. The balsamic vinegar gets caramelized a bit on the bottom of the pan. Then you can scrape all of the goodness stuck to the pan and incorporate it into the sauce. Plus the smell is amazing as this is simmering away! Brown the meat over medium heat in a large sauce pan. When almost cooked through, add the onion and carrots. Continue cooking until the veggies are soft. Add green pepper and garlic. Once the meat is browned and the veggies have been cooked, add the balsamic vinegar. Let the balsamic vinegar cook down a bit and it will start to caramelize. Scrape the bottom of the pan to remove any browned bits. Add the tomatoes and sauce. Bring to a boil, then lower heat and let simmer down for at least 10 minutes….or longer. I usually add cooked pasta right into the sauce and toss with the sauce. Hooray for Summer and the kids being off of school! It was a great day to pick some fresh herbs from our garden. All of our radishes were ready to harvest too. This fruit & veggie plate made for a super healthy afternoon snack with my girls on the porch. We didn’t limit ourselves to veggies, we even tried it with peaches and plums. I love it when they at least try a new veggie they wouldn’t eat before! 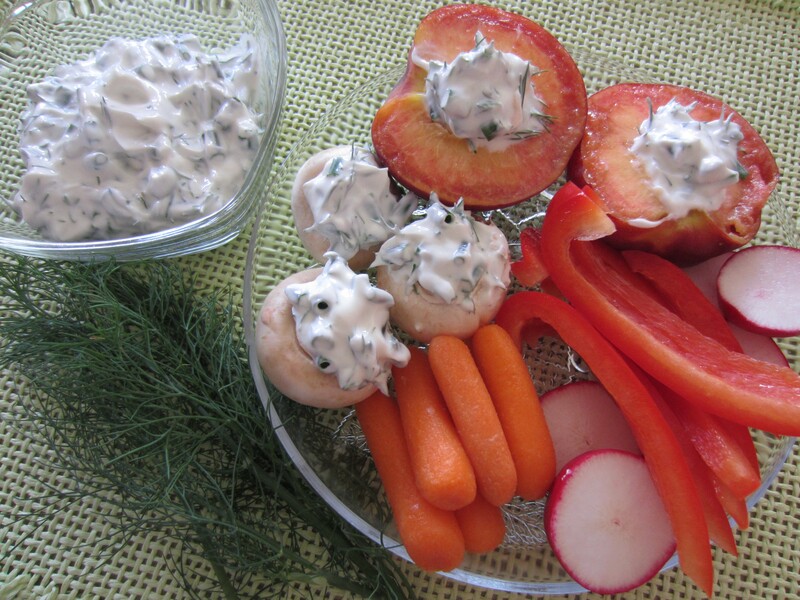 I don’t think you can get any healthier than this dip! It is only made from Greek Yogurt (which I think has the same taste and consistency of sour cream). I chopped some fresh chives, thyme and dill and added a little salt to taste. The kids were pleasantly surprised that they liked it! Combine all ingredients and serve with veggies and fruit. The spring fairies must be visiting my garden! The flowers are blooming and my daughter has been busy building fairy houses in our yard. She just turned 7 and to celebrate, I wanted to make a fairy house cake for her party. A few years ago, I bought a beautiful story book called Fairy Houses by Tracy Kane. It was about a little girl who went into the forest on an east coast island to build fairy houses made only out of natural things. My daughter enjoys the idea so, that we still go on walks to collect sticks, bark, rocks and even seashells on vacation. You may not collect anything living. She then builds these cute little homes for the fairies, tucked into hidden places in our gardens. I thought it would be very fitting if she had a fairy house cake for her birthday! 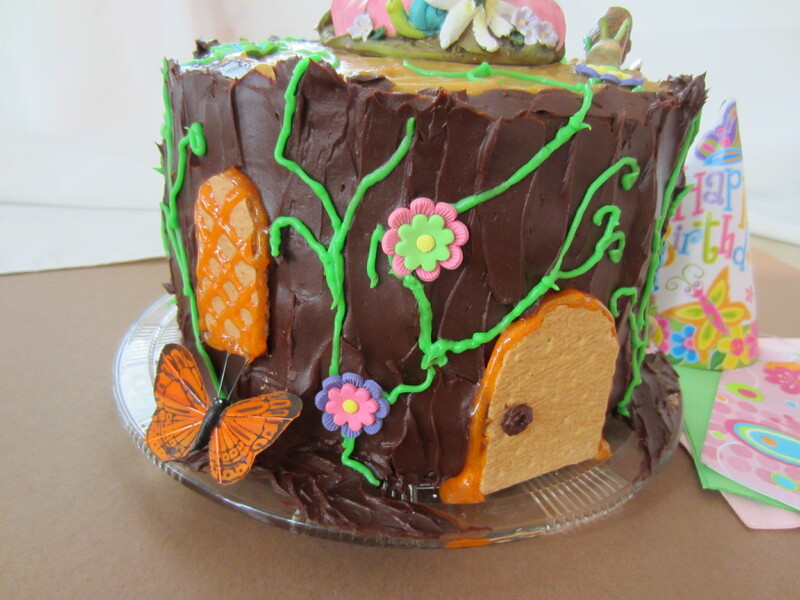 The idea was to make the cake look like a tree stump fairy house. It had 4 layers of chocolate cake, two 9″ layers of dark chocolate boxed cake mix and two 9″ layers of german chocolate cake mix. The layers were alternated light and dark to add interest when you cut into it. The chocolate ganache frosting was very simple to make. I was inspired by a recipe from Ree Drummond (The Pioneer Woman). Heat the heavy cream until very hot (not boiling) and add the chocolate chips. Stir over heat until completely melted. The mixture will turn smooth deep chocolate color. Remove from heat and pour into an electric mixer bowl. Refrigerate until completely cooled, but do not let harden. After 2 hours, the bottom of the bowl was just slightly warm to the touch. I added the vanilla and started to beat the chocolate using an electric mixer until light and fluffy. The chocolate ganache frosting filled between each 9″ chocolate cake layer and the sides of the cake. I covered the sides of the cake and then stroked from the bottom up to create the look of bark. The door and windows were a graham cracker, cut with a knife to shape. 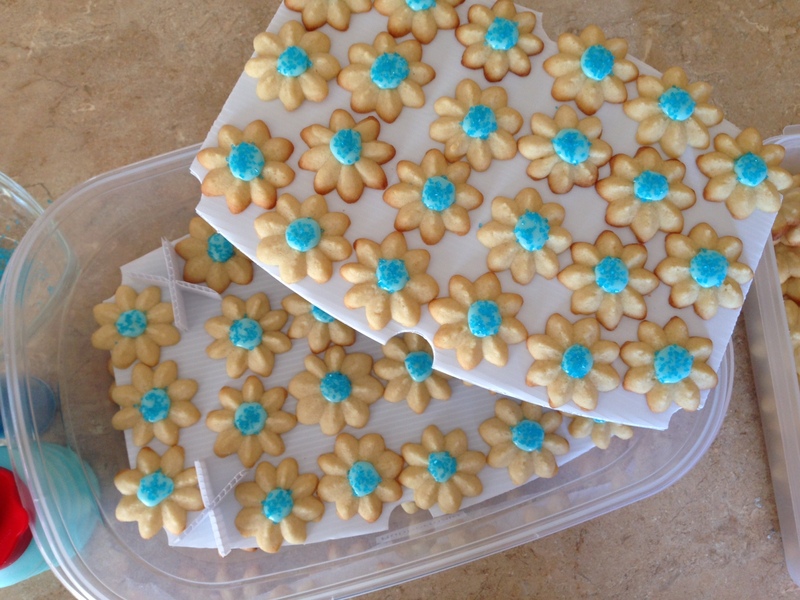 They were trimmed with a tube of orange decorative cake icing. The vines were piped using a tube of green decorative cake icing. 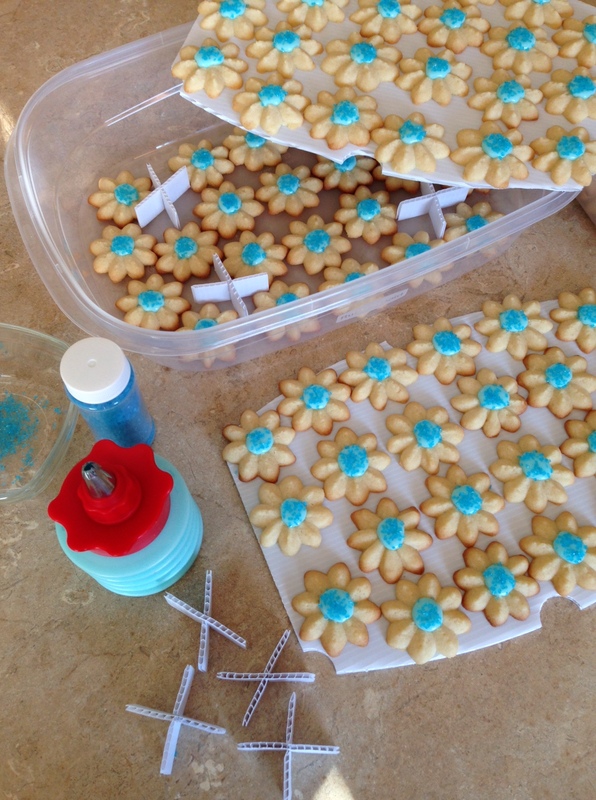 The edible sugar flowers were packaged by Wilton. To vary the color of the top of the cake, I made a box of butterscotch pudding and spread this over the top of the cake to look like the inner part of a tree. 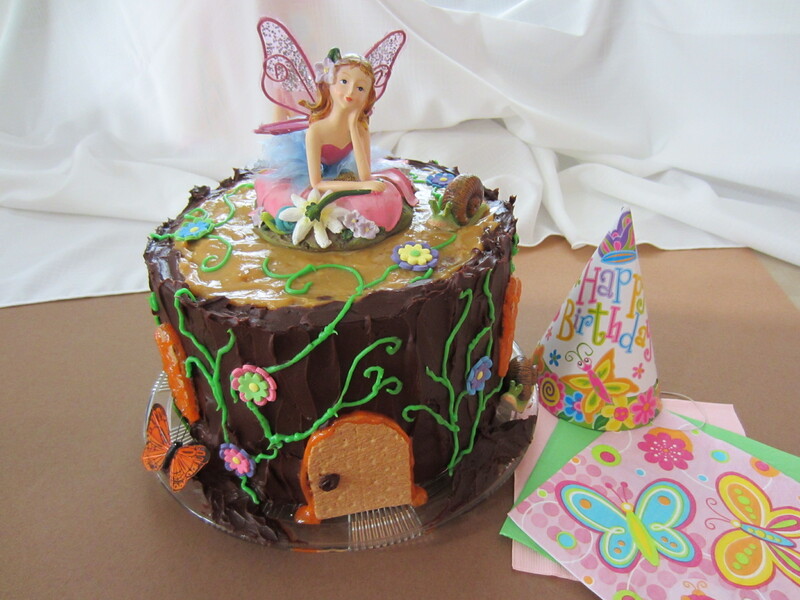 The fairy figurine that adorned the top of the cake was purchased at a local craft store. 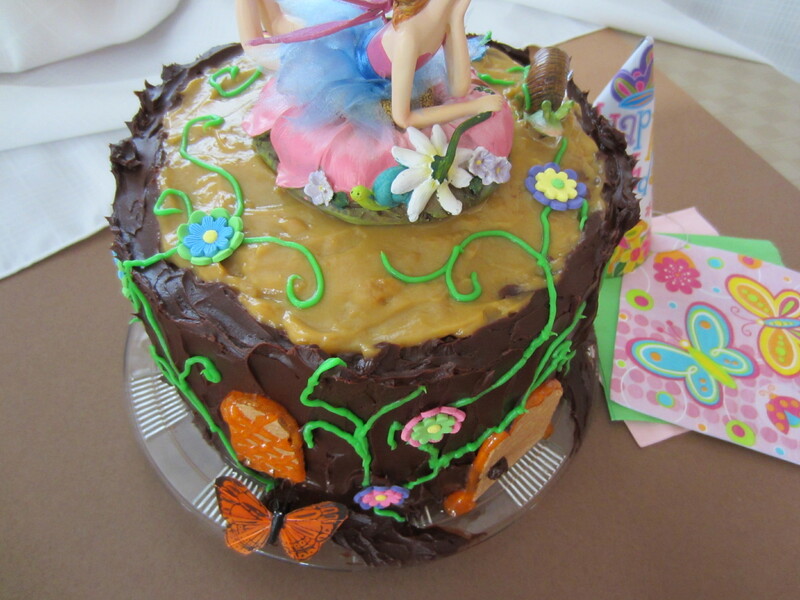 A piece of wax paper was placed down underneath to separate her from the cake. The fairy figure will make a neat keepsake on my daughter’s bedroom shelf after her party. The springy butterfly party plates napkins matched perfectly! Happy Birthday! Stop growing so fast!! Easy Peasy Lemon Squeezy Baked Chicken should have been title of this dish! So easy, so tasty and just a handful of ingredients. Prepare baking dish and drizzle bottom with 1 tablespoon of olive oil. Layer the lemon slices on the bottom of pan and place chicken on top. In a small bowl, whisk the olive oil, lemon juice, garlic and S&P. 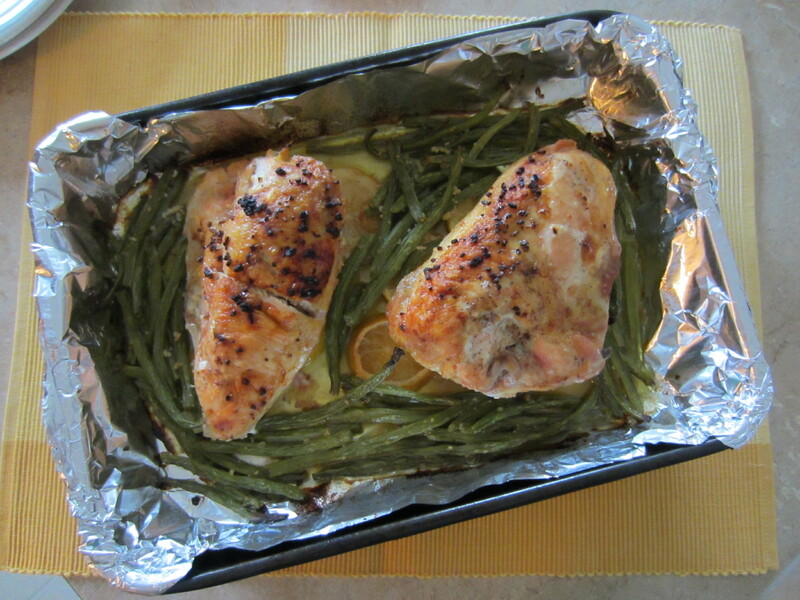 Toss the green beans in mixture and pour over the chicken. Bake for 50-60 minutes, until the chicken is fully cooked. About half way cooked, spoon juices over the chicken to baste. Serving suggestion – serve with pasta tossed in the lemon garlic juice from the chicken bake. 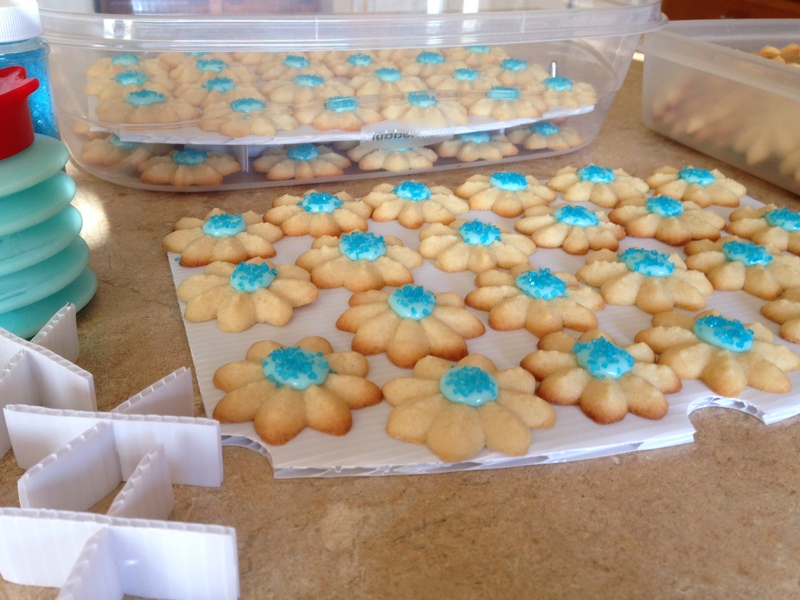 It was quite a chilly day, a perfect day for baking! I finally got to try a new kitchen tool that I actually won in a giveaway a couple of months ago. I can already tell it is going to come in very handy next month for holiday baking. 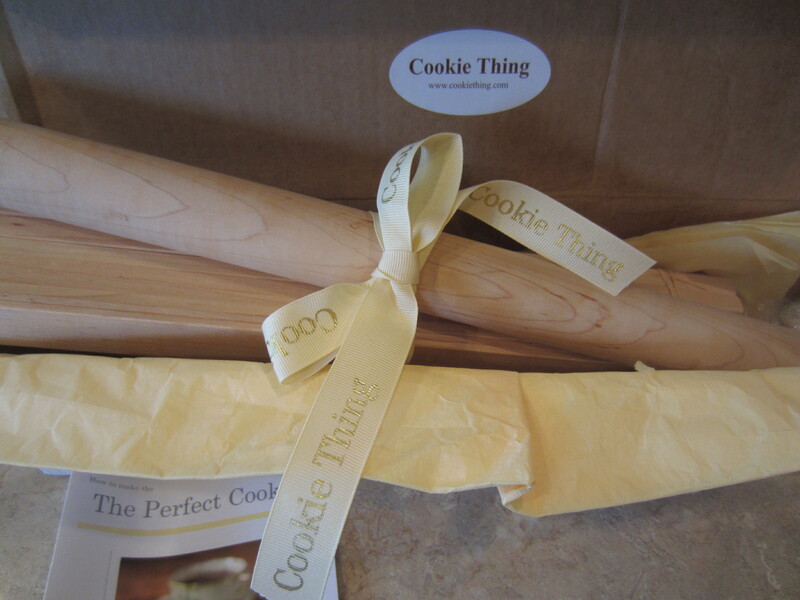 This new tool, called The Cookie Thing, is designed by Susan Butler. Quite a clever invention to aid in getting a perfectly uniform rolled dough. 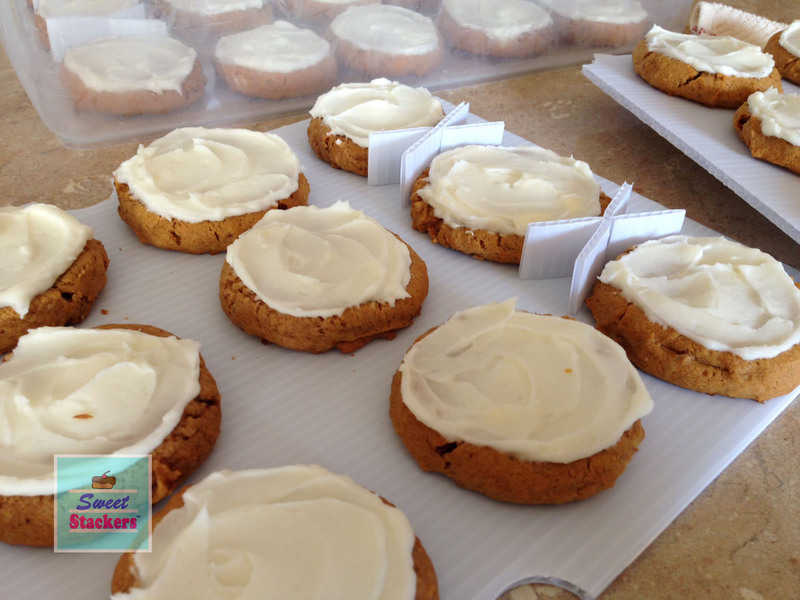 It can be tricky to ensure that each batch of cookies is the same thickness! The package I won came beautifully wrapped containing the roller and 4 different sized measuring boards. Pulse the flour, salt and sugar together in a food processor to combine. Add the butter and pulse 10 more times. Add 6 tablespoons of water and pulse 3 more times. The dough should come together and not be sticky. Divide the dough in half and shape into a disk. Wrap in plastic and place in the fridge for at least two hours. For today’s baking project, I used the thinnest measuring boards to roll dough for homemade toaster pastries. 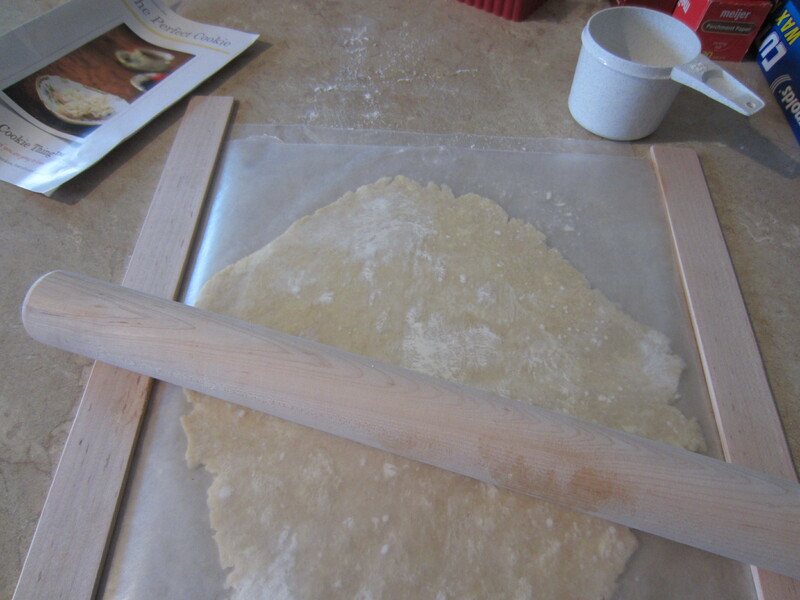 Cut the dough with a rectangular shaped cutter or knife approximately 4″ x 3″ (I used a toaster pastry press). 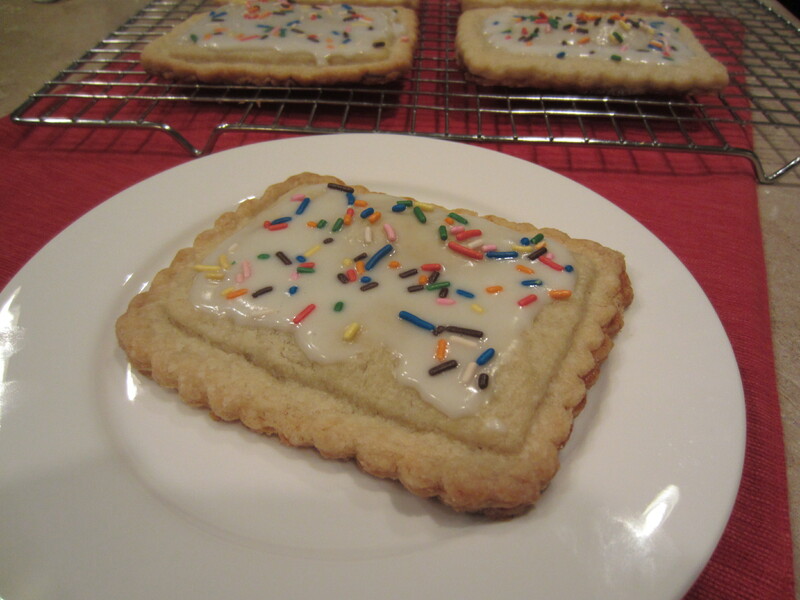 Place the bottom layer of dough flat on a cookie sheet. Add 1 tablespoon of filling and spread leaving a ½ inch border. Brush the border with egg. Place another layer of dough on top and crimp the sides to seal all the way around. Place the pastries in the refrigerator for another half hour. Bake in a 350º oven for 25 minutes, until the crust is golden. 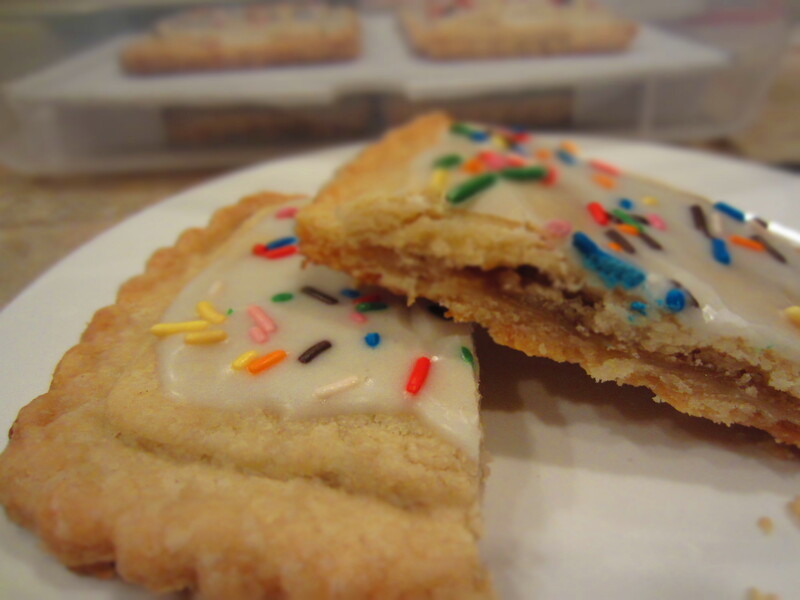 The fun part about toaster pastry is that you can use a variety of fillings. Today I used big spoonful of apple butter. But preserves, peanut butter, hazelnut spread would all be delicious! The pastry is so buttery and crunchy. A classic American treat and so much tastier than the store-bought brands!